Digital Life Certificate for Pensioners Jeevan Pramaan is a scheme introduced by Government of India by digitizing the process of securing life certificate and is a biometric enabled digital service for pensioners of Central and State Government. After retirement from service pensioners need to submit life certificate to pension disbursing agency. Now this scheme is relief for senior citizens who can avail the facility of submitting the digital life certificate to pension disbursing agency like the bank etc. 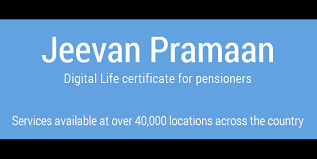 Jeevan Pramaan Digital Life Certificate is a computer generated electronic life certificate for pensioners using biometric credentials. If you have internet connection and Biometric devices at home you can generate and no need to present yourself in front of authorised officers. If you don't have internet connection and Biometric devices at home Central Government pensioner having pension account in bank can visit Citizen Service Centre to get the digital life certificate. Bank Account Number, Branch detail, Name and Address. Get Digital Life Certificate in easy and friendly way. Share Jeevan Pramaan ID with Bank. Key 'JPL' give space 'Type Pin Code' - send SMS.